Location: County Antrim, Northern Ireland. Notes: Kinbane Castle (Caislen Ceinn Ban, White Head Castle, Kenbane Castle) is situated in County Antrim, Northern Ireland, on a long, narrow limestone headland projecting into the sea, approximately 5 km from Ballycastle on the road to Ballintoy. The name Kinbane means White Head and refers to the white limestone on which the castle stands. Not much of the castle remains, and the path up to it is narrow and stepped. Kinbane Castle is a State Care Historic Monument sited in the townland of Cregganboy, in Moyle District Council area, at grid ref: D0876 4383. The area surrounding Kinbane Castle is a Scheduled Historic Monument, grid ref: D0879 4381. It also offers spectacular views of Rathlin Island and Dunagregor Iron Age fort.A two storey castle was built in 1547 by Colla MacDonnell, brother of Sorley Boy MacDonnell, with a large courtyard with traces of other buildings, probably constructed out of wood. In 1551 the castle was besieged by English forces under Lord Deputy, Sir James Croft, in the course of an expedition against the MacDonnell's. Another siege in 1555 by English forces, the castle was partly destroyed by cannon fire. Rebuilt afterwards, Colla MacDonnell died at the castle in 1558. The hollow below the castle known as Lag na Sassenach (Hollow of the English) and it was allegedly during the 16th century that a garrison of English soldiers laying siege to the castle were surrounded and massacred. Fires lit on the headland as calls for assistance were answered by clansmen who came from all directions and surrounded the garrison. Sorley Boy MacDonnell exchanged the castle with another property at Colonsay with Gillaspick MacDonnell, son of Colla MacDonnell. The castle was then presented to the Owen MacIan Dubh MacAllister, 2nd of Loup, Chief of Clan MacAlister as a reward for their service and loyalty to the MacDonnell clan. Owen MacIan Dubh MacAllister was killed in 1571 during a skirmish with the Carrickfergus garrison, fighting alongside Sorley Boy. 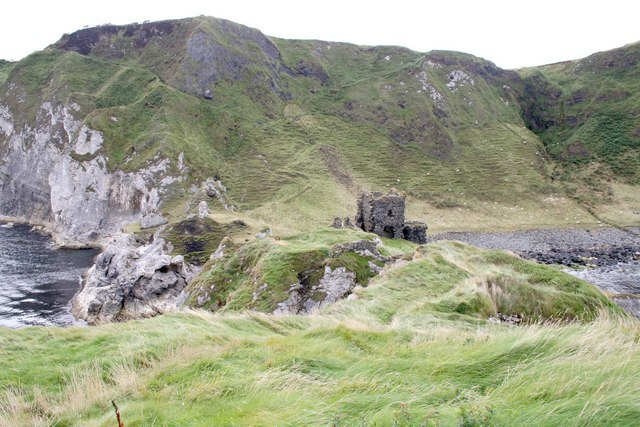 The castle remained in the descendants of the MacAllisters of Kenbane until the 18th century.